This is my second model (well.... successful model) out of Meenakshi Mukerji's Origami Inspirations. I struggled with this model. I think part of my problem was due to some poor paper choices. Despite the fact that the books specifically suggested using the same weight/type of paper for face and join units, I went rebel and used a light tissue weight with a heavier text weight paper. While the results are not disastrous, they are far from what I had hoped. For the face units I used a silk-screened paper with small gold and silver Ginkgo Leaves on an Ivory background of linen-free mulberry paper that is machine made in Thailand. For the join units I used Purple Batik paper which is handmade in India of 100% cotton. Both sides are finished, with metallic gold veins running through the purple sheet. Both sheets were purchased from Hollanders.com. I did use glue as the paper choices I made did not allow for sharp enough creases to hold the shape. This was my second attempt at a tassel and it went much better than the last time. I would love to say I added the embellishments out of inspiration, but it was a weak attempt to mask the bad paper choices. Not that the paper was bad, because it was beautiful. But it was clearly not a good use for this project. 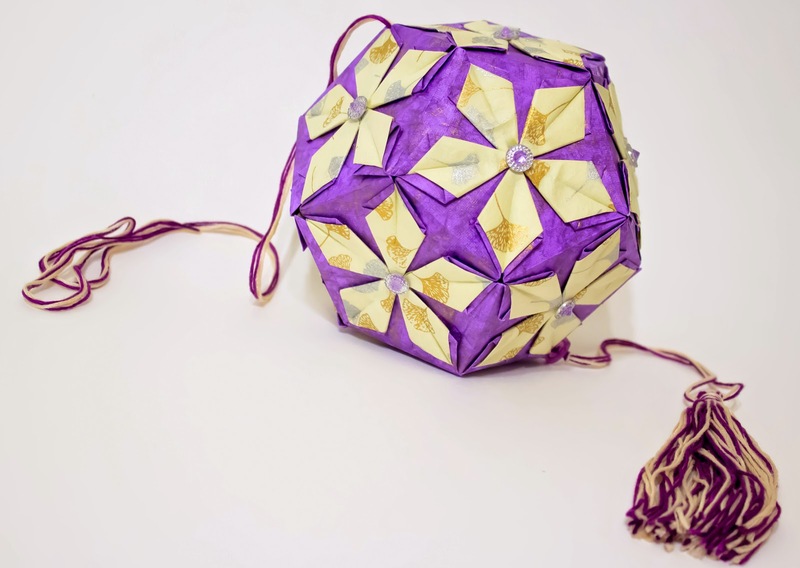 very nice kusudama! I like this model a lot. But I am not able to fold the join units. Would you be so nice and give me some advice? I was trying to fold the units following the steps on page 44 but I am not sure with number 10. Many thanks, lucie from prague, czech rep.
Let me review my book tonight and get back to you tomorrow. I too struggled with the join units at first. In step 10, you will use the middle guide marks made in step 9 as a center line of reference. For the first one it might even help to fully fold step 9 and 10 until you can see how your finished unit will look. When making the units for the actual model you will want to avoid these extra lines to they don't appear in your finished model. So after you have created your center line in 9, you will fold the right and left (bottom horizontal) edges into the center vertical line created in step 9. When you make the fold the right half of the bottom will line up to the center line you made in step 9. For the finished effect you only want to crease the part that lies above the horizontal fold line. My primary mistake came in step 13, where you untuck the folds from step 11. Let me know if you are successful. If not, send me an email with pictures or video of how you are folding to thelavaturtle@yahoo.com so I can see where you are struggling. I´ll try to send you and e-mail with pictures with the folding steps and ask you for your help.